Pssst! No need to freak out about writing the text for your design portfolio - it turns out that there are more similarities between design and writing than you’d expect. Hurray! Let’s all agree on one thing: design is about communication and storytelling. Luckily for us, so is writing. As frightening as it may seem to venture into the challenge of writing the text for your online design portfolio, remind yourself that these two disciplines ultimately have the same goal: to communicate a message. In design, you may emphasize a point through visual hierarchy, whereas in writing, it could be through paragraph structure or the right choice of words. The perfect combination of color and form within a composition will depict certain emotions or stories, in the same way that the accurate amalgamation of words will articulate the right narrative. And when visuals and text are put together, the sky’s the limit. When it comes to making an online design portfolio, use both to complement and strengthen one another, essentially conveying your own story in the best possible way. The introduction is the short piece of copy on the top fold of your portfolio that clearly and succinctly conveys who you are and what you do. It’s not the place to get all conceptual and overly flamboyant, so cut to the chase with just a couple of well written lines. If people don’t understand fairly quickly what they’re looking at, it’s likely they’ll lose patience and move on. 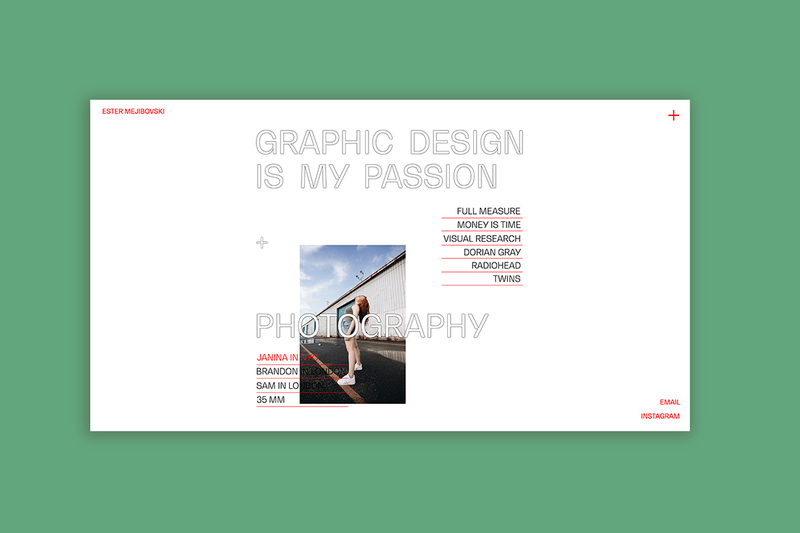 Graphic designer Ester Mejibovski has perfected the art of the introduction on her Wix website. Not only does she state what she does and where she is based, the subtle addition of the word ‘breathing’ gives a hint as to her personality. This is also a good example of design and copy coming together cohesively, as the outlined type (that also happens to be a hot typography trend) gives the sense of a breath of fresh air, emphasizing the meaning of the words themselves. The same goes for the introduction on Steve Wolf Designs’ portfolio. The two sentences on the top fold are to-the-point and are emphasized thanks to the use of white space and a different font than the menu. 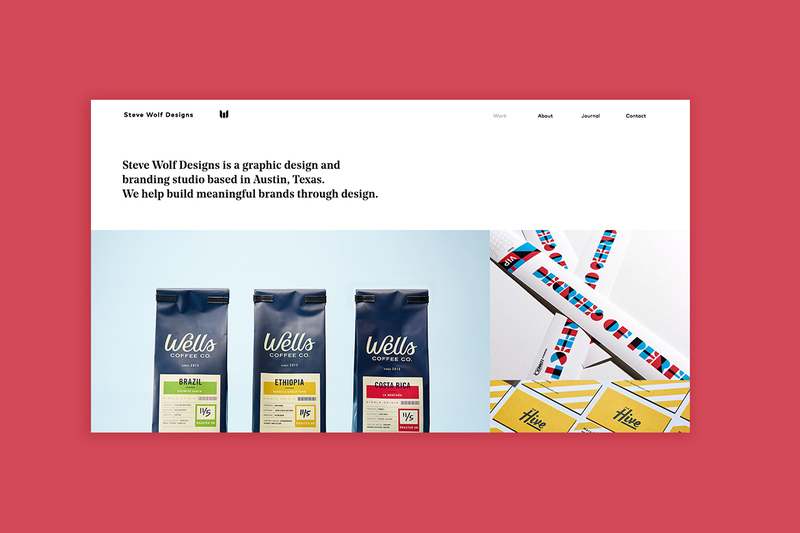 Steve Wolf Designs’ portfolio, created with Wix. You’d be surprised, but this is actually one of the most important pages of your portfolio. People want to understand things quickly these days, which is why they’re likely to head to your ‘About’ page pretty early on. Including more information than your introduction, this section gives you the chance to add a drop of pizzazz to your portfolio, while staying aligned to your and your site’s general tone. Explore how you can present the information in a story-like way that reflects your personality and makes you stand out; try adding a witty remark here or there, opening with an intriguing sentence or sharing what excites you about design, or about life in general. These will make your text more unique and memorable, as well as giving a feeling of the real-life person behind your works. – And lastly, consider writing your email address here, so that any interested parties will feel they can contact you easily. 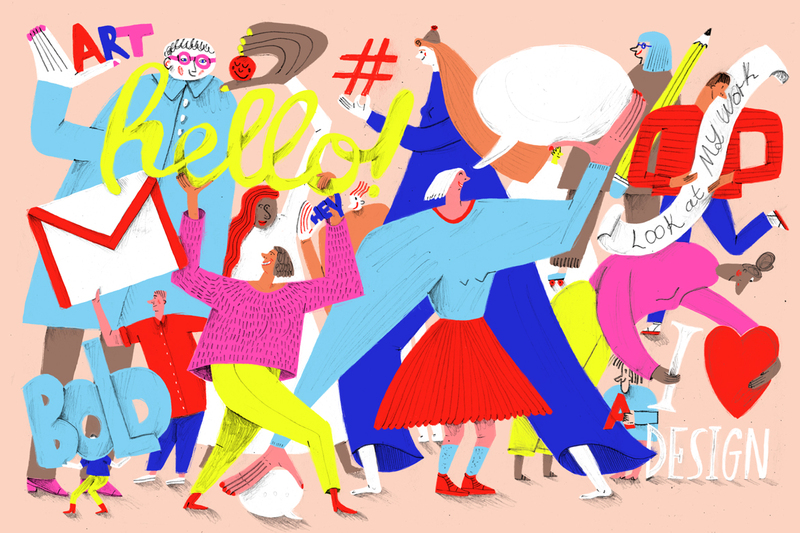 Artist and illustrator, Carissa Potter, has ticked all the boxes with the delightful language used on the ‘About’ page of her Wix website. The ‘About’ page of Carissa Potter’s website. Graphic designer Brittney Johnson has included only a short few lines on her Wix portfolio’s ‘About’ page, but has made sure to add a statement that gives us a peek into her character, and has helped us get to know her better with a photo of herself. Before you go into full-out panic mode, don’t. Remember that at the end of the day, you are the best possible person to be presenting your project – you know all the ins and outs and you were there every step of the way. A good rule is to remember that you’re writing for real people that want to get to know you. You don’t need to provide a very analytical, formal report of the project, but rather tell a short story that sets the tone and helps people get some insights into the way you work and your thought processes. Stick to your natural style and personality, while of course making sure to use appropriate language and correct grammar. How you approach this section of your portfolio very much depends on your field of design. Generally, UX designers will want to go into much more detail with in depth case studies and work processes. – A brief explanation summarizing what the project is all about. – Background info, including the client’s name, what they do and where they’re based. – The goal of the project and a few words on the brief you were given. – Remember to give credit to your teammates or partners and explain what your role in the project was. – A few details on your research for the project and the most interesting findings or insights. – The main challenges you experienced. – Lastly, sum up with a few words on the final result, including your main takeaways from the project and highlighting what was successful. If you’re concerned that all of these details will get too lengthy, see how Brittney Johnson has structured her project page, using drop-down menus that break up the content into nicely-sized chunks. By adding tags or keywords for each project, your audience can also get an immediate idea of what the project entails. 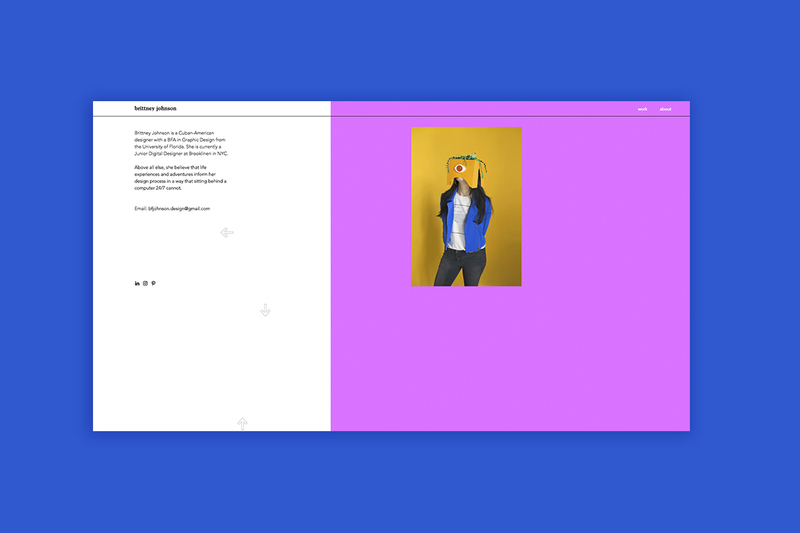 A project page on Brittney Johnson’s design portfolio. For non UX designers, it’s more than okay to keep it brief. 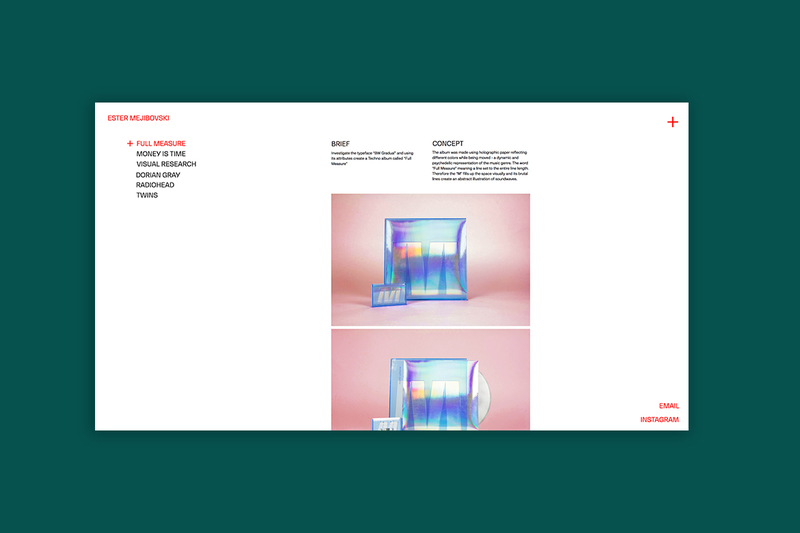 See how Ester Mejibovski has also gone for an organized format on her portfolio, splitting up the content into ‘Brief’ and ‘Concept’. A project page on Ester Mejibovski’s design portfolio. So you’ve gone through all the long pieces of content that require introspection and an understanding of who you are as a designer – fantastic! 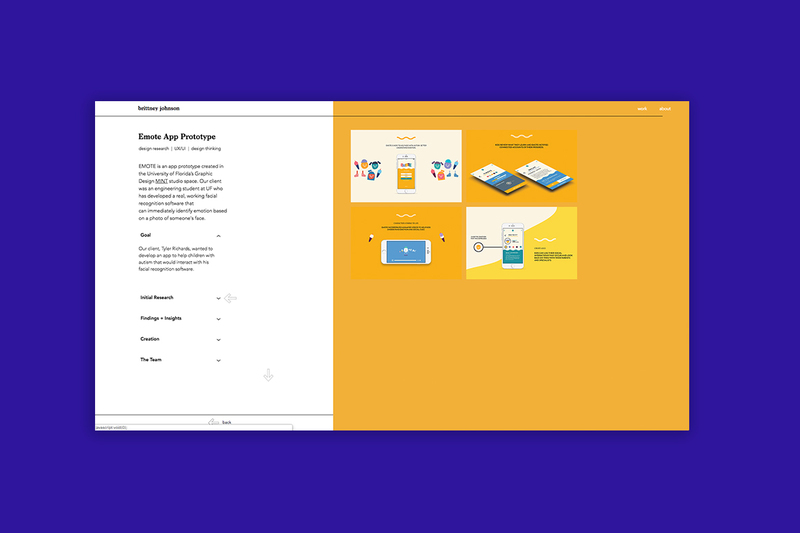 Now is the time to have some fun, with little bits of microcopy that can discreetly add a sense of personality to your portfolio. When designing the buttons and menu for your site, think beyond the standard microcopy. Notice graphic designer Liron Ashkenazi’s very on point “let’s talk” in the ‘About’ section of her Wix website, or the sneaky, yet loveable “Don’t steal anything, duh” on the footer. 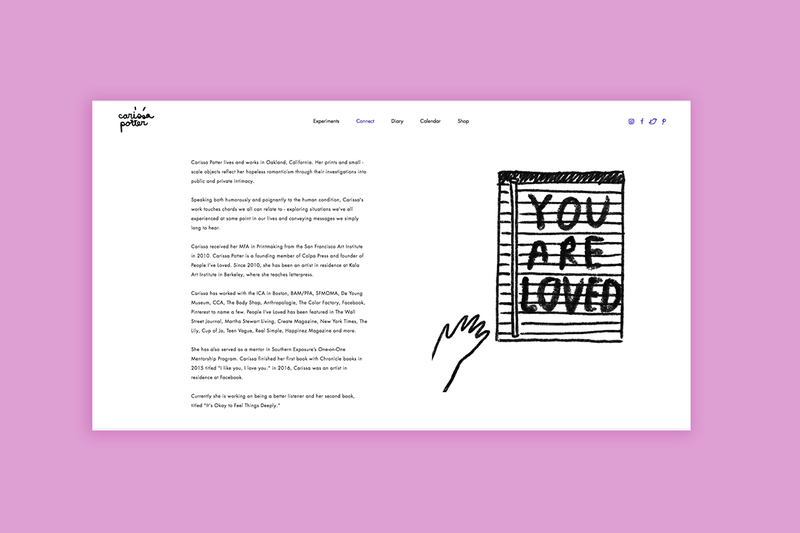 Also, take a look at Carissa Potter’s adorable use of text inviting site visitors to sign up to her newsletter – “We will only send you love and sometimes some words to go with it” (I mean, who can resist that?!). Could you do with a drop more inspiration? Head over here to check out these top design portfolios.